SPX - The follow through is good and the RSI looks promising. The one in December went sideways for a while, but this one is coming right off of the 50sma and would be more likely to run higher instead of sideways if it continues higher. SPX - I still have concerns with the weakness internally of the XLF, so I'm watching the General Markets closely. So far we have a swing low and a move that closed above the 10sma Wednesday. Anyone long should still be using a stop as we wait for an overhead trend-line to be broken. 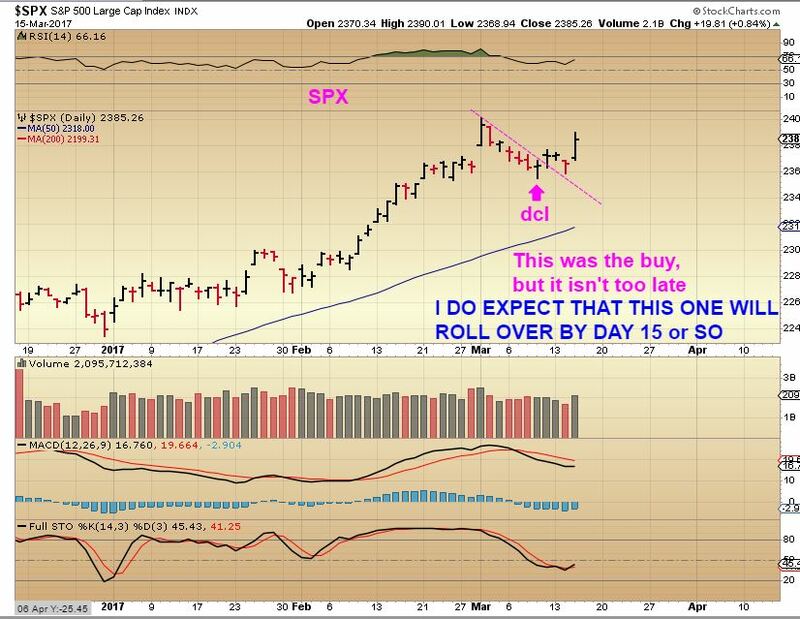 SPX - I was expecting 1 of 2 things, either a deep drop into an ICL, or a shallow drop that may eventually lead to a blow off parabolic type top later. 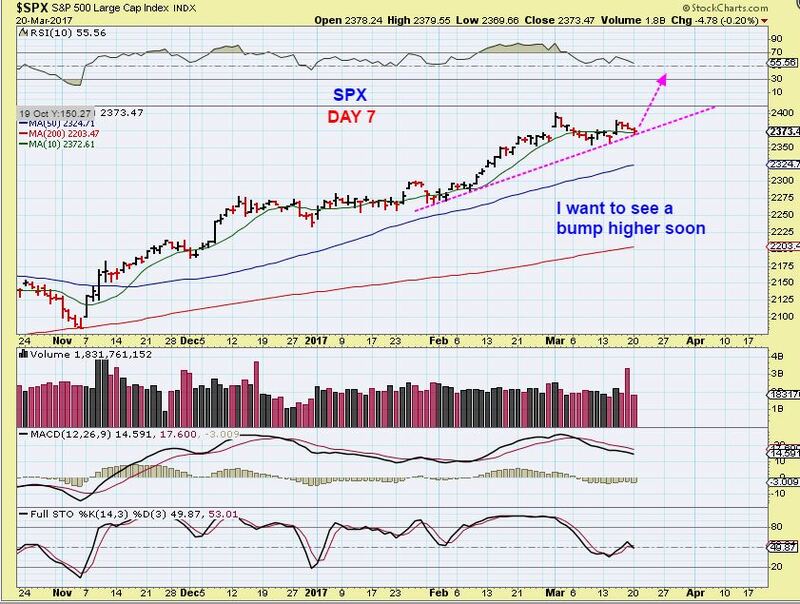 So far the dip to the 50sma reversed on Monday and Tuesday saw some follow through. That is a swing low in place and it almost closed above the 10sma, so you have an entry and a place to put a stop, even if the selling isn't really complete. With the recent volatility in the markets, we have seen the equity markets sell off, Banking and the XLF were hit hard, Oil & Energy stocks sold down, NATGAS bottomed , and The Miners and Metals have been volatile in their own way. In this environment, we had to try to find a few trades while balancing the risk. There are times that trade set ups are everywhere, yet at other times, like during these choppy volatile markets, it may be best to take it slow, keep position size smaller, and for some it is even best to just wait. 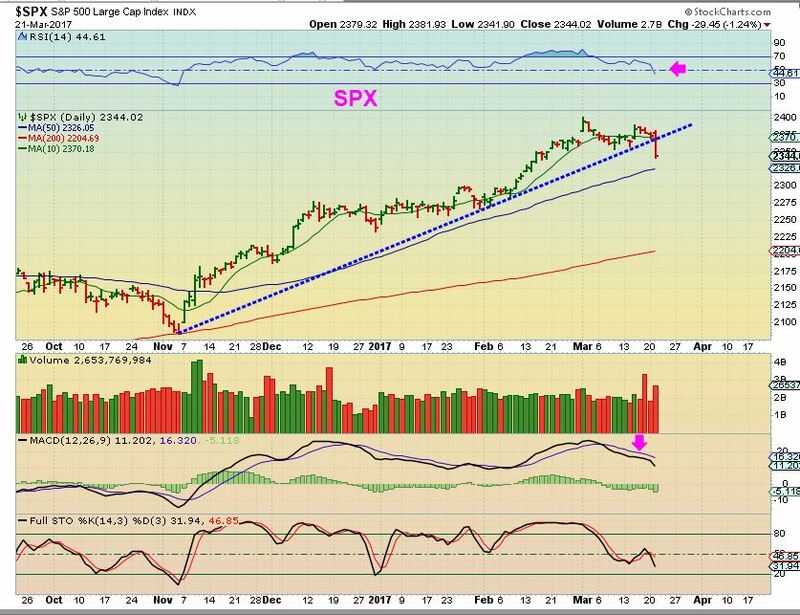 This choppy market action eventually sets up the next series of trades. 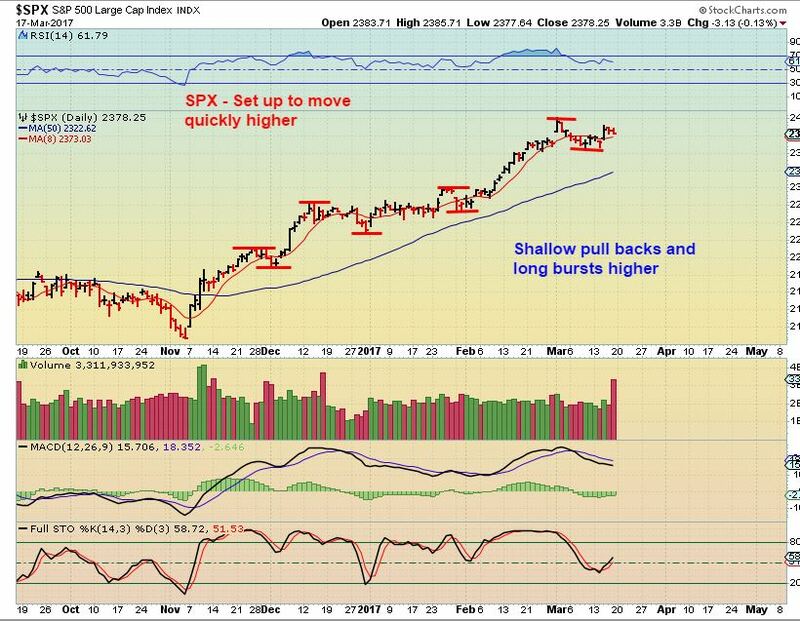 Despite the choppiness, we still found a few bullish trade set ups and some have already been really rewarding. I want to point out a few more of these trade set ups after we review the market activity for Monday. 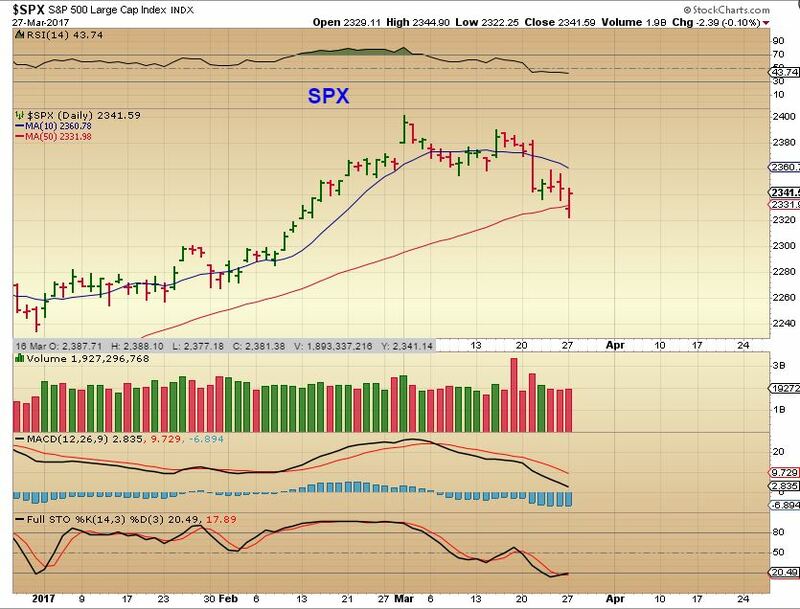 SPX - The General markets gapped down and then put in a reversal around the 50sma. You could buy this with a stop below the 50sma, but it is hard to tell if all of the selling is really done without some follow through. The 'safer' buy is still ahead. We'll see what Tuesday brings. 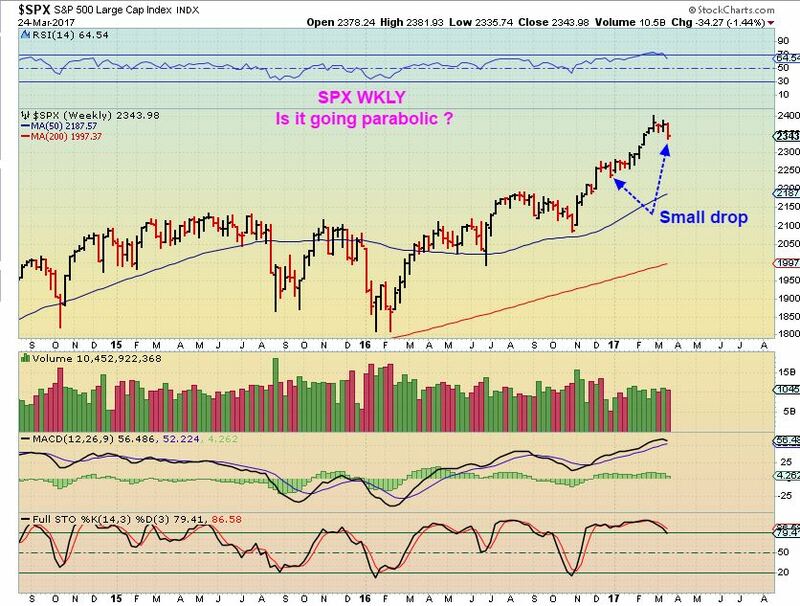 SPX #1 - The drop on the weekly chart isnt drastic, we've seen similar drop before. If it just continues up from here, we could be witnessing the beginnings of a parabolic type move. 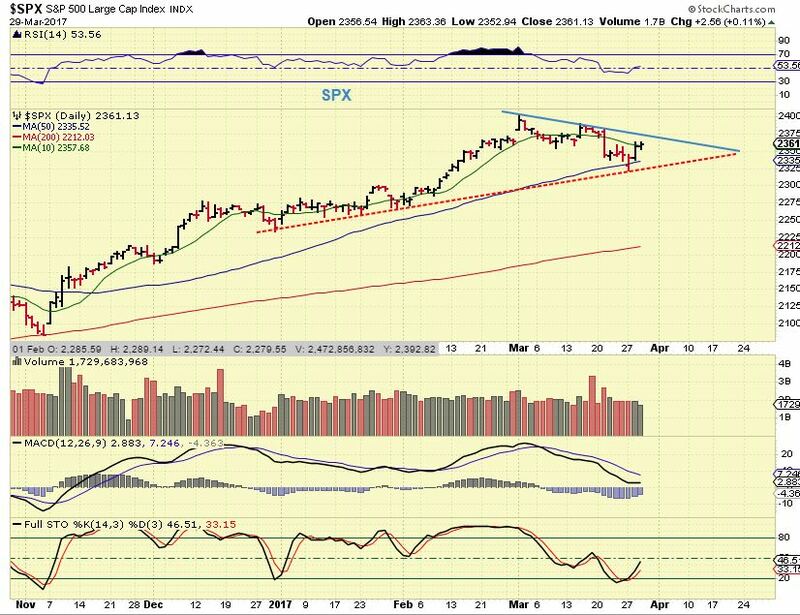 SPX #2 - We do see a trend line break, so the drop can continue lower. LOADING * LOADING * LOADING... As we watch various markets lining up or setting up for the next trade, it often reminds me of that dreaded "LOADING" symbol that shows up when you are using a slow internet connection. It seems like it takes forever to 'get connected' to the internet. With trading it can also seem like it takes forever to get things lined up for a low risk trade set up, but patience has its rewards. As the saying goes, "Good things ( including good set ups) come to those that wait." 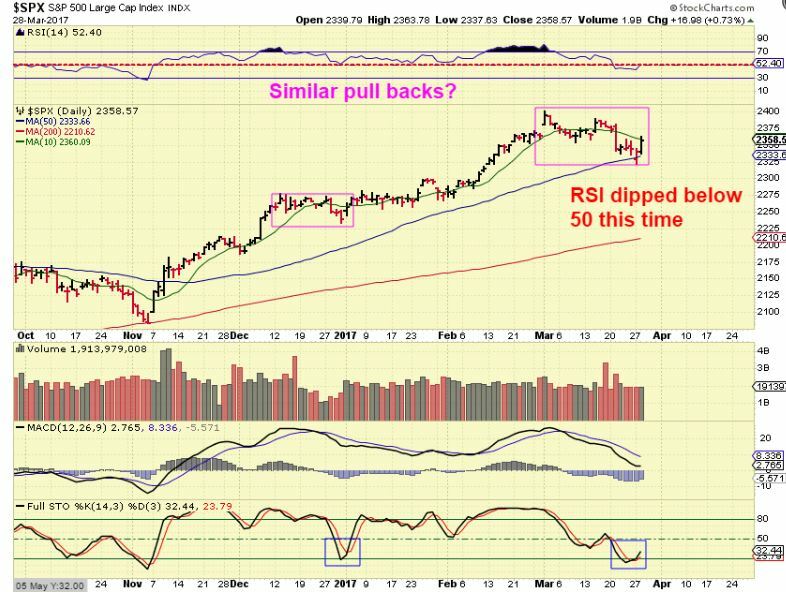 For our Friday report, we will review how some set ups are playing out well, and others may be setting up now. Each day adds another piece to the big picture, and things seem to be lining up. Let's take a look. The Markets are basically all over the place since the Fed Rate Hike and Tuesdays drop in some sectors seemed to come out of nowhere. At this point in time, I want to review expectations past and expectations now. 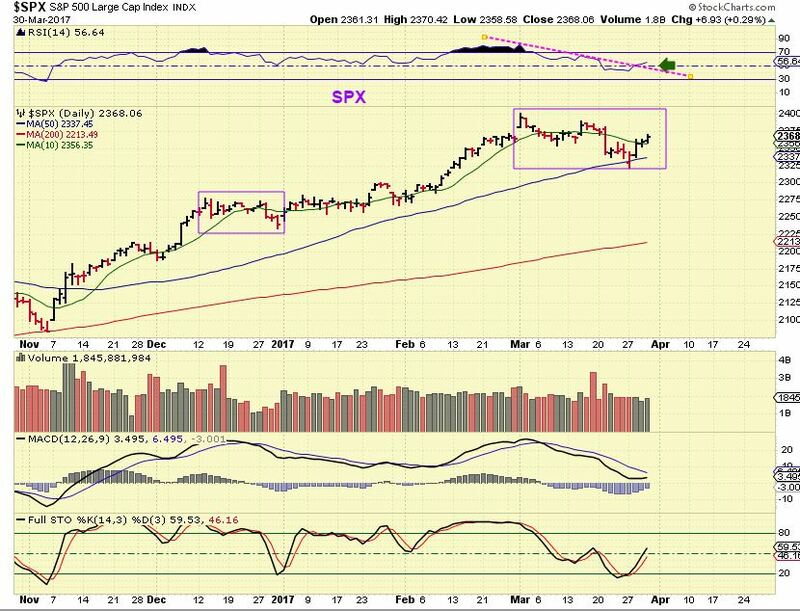 SPX - On March 7th, We were looking at a drop into a dcl. I expected it to possibly tag the 50sma and slightly break the trend line, as shown in this chart. SPX - 1 week later we had a bounce and it looked like the dcl came in and we got our swing low. I still hold to this idea, but when you get a daily cycle as right translated as the last one was, you look for a POP to new highs and then it can roll over. See what I wrote on this chart. So after a bounce to new highs, we would look for the markets to roll over into an ICL . 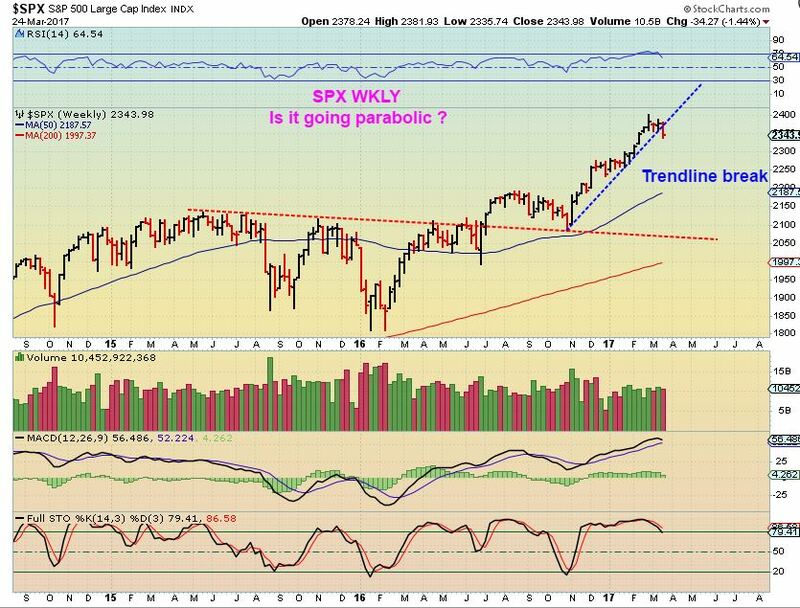 SPX MARCH 21- We did not get our push to new highs before the markets just took a sudden plunge. This looks like a drop into an Intermediate cycle low (ICL) has started, the multi-month trend line has been broken. The low that I labelled as a dcl has been broken. It would be best to watch how this drops and see if the next swing low sets up a BUYING opportunity. 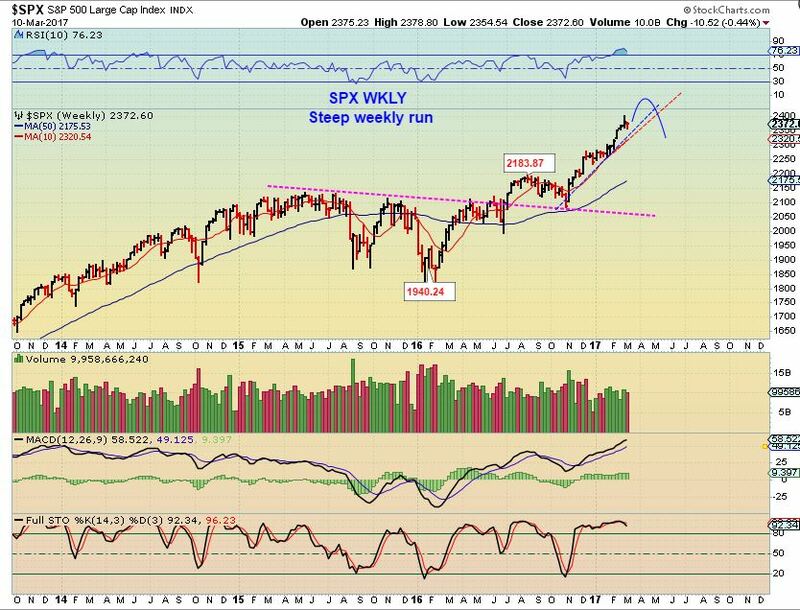 SPX from the weekend report, I think we'll get another run higher soon. 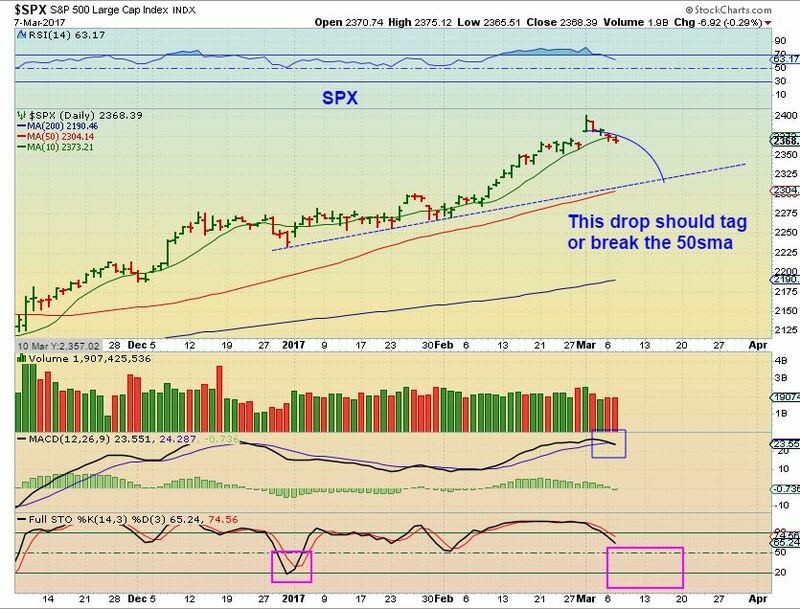 This was my MARCH 10th SPX chart- I expected the general markets to drop back a bit more on the pull back, and then to put in another run higher. It would then be in the timing to roll over into an ICL as shown.